I’ve decided I should skip watching any fashion shows except the couture shows, with their very reasonable schedule (a few days in January and July), in Paris, with the finest sewing on the planet. There’s no worry that I will want to buy anything I see since I’ve read only about 100 women in the whole world can afford haute couture clothing. While that statistic should be depressing, I find haute couture anything but. It’s pure inspiration—for the looks, the colors, the design ideas, the narrative. And did I mention the sewing? I didn’t like this show as much as I did the last couture show, where all the dresses and jackets were blue and the models walked down an airplane aisle, but when it comes to Chanel I always find at least one thing to love. These were my favorite looks from Uncle Karl this time around. Not only beautiful, but comfortable-looking! Love this look, especially the silver tights. Love the color of the dress, the gloves, the snood! I would like to see this pink and silver duster up close. 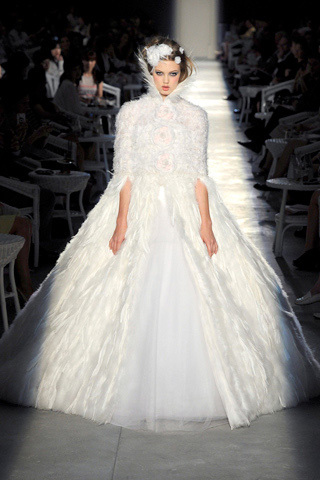 Chanel winter wedding dress, anyone? 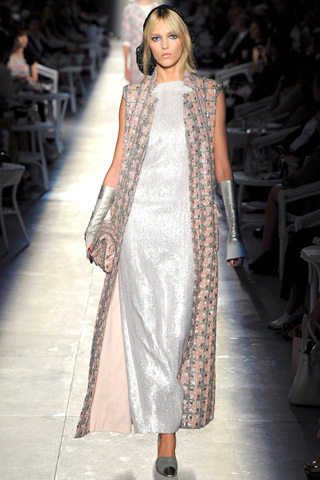 I love the pairing of the colors--pink and silver/grey. would love to track down a pair of the silver stockings/tights. The colors and silhouettes are beautiful, but like you I am mostly impressed with the seamstress and pattern making skills. I took classes a few years ago, and you really get an appreciation for the genius and technique that is crafted over many years in turning bolts of fabric into walkable art pieces. I think that's why we love labels like Chanel and Prada and Hermes: it's not the exclusivity; it's the craftsmanship. 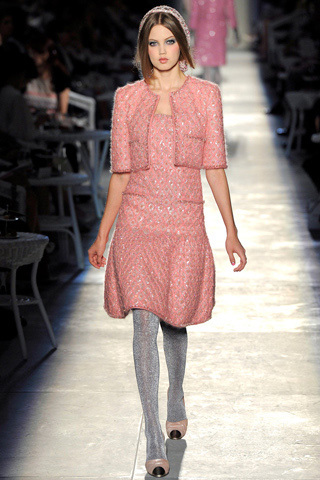 Much rather see a REAL WORLD outfit styled in an interesting way than anything that comes down the runway. I get more inspired looking at mannequins in store windows where I can actually imagine myself wearing it than something I will never even see in the stores in my town. I do love watching the couture shows for the fantasy element too but is this the couture show? It's very toned down for couture isn't it? I mean it probably still costs an arm and a leg but I recall couture of old was less practical and more fantasy - more of the wedding dress in the last photo and less of the skirt suits; I wonder if it's a sign of these economic times and them finally impacting the couture the houses are putting out as the number of women who can afford may have decreased of late. I also had my heart set on making a Chanel Camellia. Now I know why they cost so much.